Replacing wheelchair upholstery is one of the easiest things you can do to improve the look and comfort of your wheelchair. For most manual and power wheelchairs, the upholstery is replaceable including the seat, the seat back, armrest pads, and the calf pads (from the elevating leg rests). Some power wheelchairs with captain’s style seating require you to purchase a new seat assembly from the manufacturer (you can also contact a local auto upholstery shop and have the seat and seat back recovered). All you need to order a new wheelchair seat and/or seat back is know the size, how it attaches to the wheelchair, and material it’s made from. It may help to have the brand and model of your wheelchair too. Wheelchair seat and seat back size: For a manual wheelchair, unfold it completely first, then measure the width and depth for a seat or width and height for a seat back. Measure from edge to edge. For a power wheelchair with a sling seat, measure the width and depth and width and height for a seat back. If you have a power wheelchair with a captain’s style seat you will probably have to contact the manufacturer. You can try a local auto upholstery shop and the seat recovered. Most upholstery shops can use whatever material you want, so you can have some fun with it. How does it attach: If your wheelchair upholstery attaches via screws, note the spacing between the screw holes measuring from center to center (see example below). What material is it: Nylon and Vinyl are the most common and in some cases you can switch from nylon to vinyl and vice versa. Nylon is available in black only and some vinyl is available in different colors. Most nylon and vinyl options are latex free. Wheelchair brand and model: Much of the wheelchair upholstery that is available today for a manual or power wheelchair is based on one of two designs, Invacare and Everest and Jennings (E&J). Some wheelchair manufacturers use designs from both and some have their own designs (Quickie for example). In most cases having the dimensions can save you from worrying about knowing the brand and model. 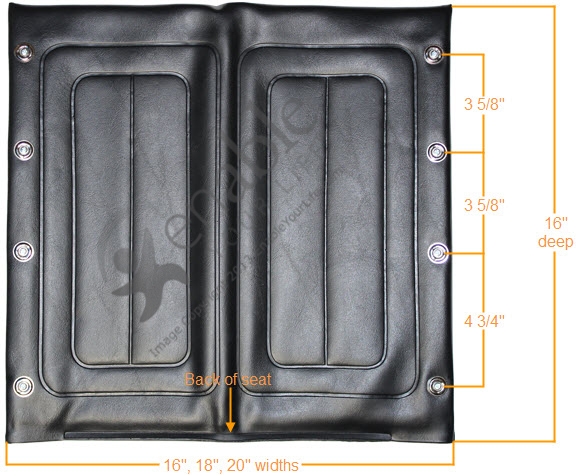 To replace your wheelchair armrest pad, you need to know whether it is full length or desk length, the material you want or need, and the hole spacing of the mounting holes. Desk length or full length armrest pads: A desk length armrest pad is the shorter of the two. It was designed for a desk length wheelchair side panel which allows the wheelchair to roll up to a desk or table. Some power wheelchairs use desk length armrest side panels and armrest pads to make room for the joystick controller. A full length armrest pad generally runs the length of the wheelchair side panel. Having a longer full length armrest side panel means the wheelchair cannot roll under a table or desk. You must purchase the size you already have since they are not interchangeable without first changing the side panel. Armrest hole spacing: Most of the wheelchair armrest pads have several sets of mounting holes and thus are universal. It is still advisable to check the holes spacing of your existing armrests just to be sure (see example below). Armrest material: Most wheelchair armrest pads are available in hard plastic, vinyl, nylon, and solid urethane. The vinyl and nylon options are the most softly padded, urethane has some give and is the most durable. Hard plastic has no padding. As long as the armrest hole spacing of the armrest pad you wish to purchase matches to your existing armrest pad hole spacing, there is no wrong answer. In many cases vinyl armrest pads are available to match your vinyl seat and seat back color. Nylon material is breathable and available only in black. Fold up the wheelchair seat slightly to reduce the tension on the upholstery. Unscrew the existing wheelchair seat or seat back and pull off. Re-install new wheelchair seat or seat back with provided screws and grommets. It is normal for the upholstery to feel a little firmer once the wheelchair is unfolded as it is new unworn material. Note if you have a wheelchair seat belt installed, it may be piggy backing one of the upholstery seat screws – install as before. Installing a wheelchair armrest pad only takes a Phillips head screwdriver. To gain access to the two screws holding the armrest pad on, remove the armrest side panel or flip it up (depending on your wheelchair model). If your wheelchair has fixed armrest side panels, you can lay the wheelchair on its side to gain access. Unscrew the old armrest pad and replace with the new one using the screws provided. Once the form is filled out, you can fax it to the number on the form or email it to support@enableyourlife.com. Please allow several business days to quote out your order.